Image caption Los mármoles del Partenón expuestos en el Museo Británico. Workers are putting the final touches to the New Acropolis Museum in Athens in readiness for its opening later this week. 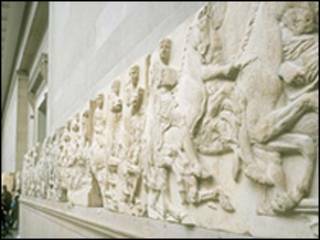 The building has been specifically designed to house the Elgin Marbles which are in the British Museum in London. This is going to be a very uncomfortable week for Britain. Greece's Culture Minister, Antonis Samaras, has stoked up the pressure by rejecting what he claimed was an offer by the British Museum to loan some of the sculptures that were hacked from the Parthenon at the turn of the 19th Century. The British Museum said it would consider a three or four month long loan, but only if Greece acknowledged that London was the rightful owner. Mr Samaras said Greece could do no such thing as it would legitimise Lord Elgin's theft and vandalism. For years, the unsuccessful efforts to secure the return of the long sculpted frieze have been conducted in polite terms by diplomats and academics. Many Greeks have become tired of what one new movement has described as the Athens government's wishy-washy tactics. Over the past four months 100,000 people have signed up for what promises to be a more dynamic campaign. Some of them will demonstrate outside the new museum the night before the inauguration. The group's leader, Alexis Mantheakis, said that if London could hand back India it should be capable of emptying a room at the British Museum.